With just three games left in the Northern Illinois women’s soccer team’s regular season, the Huskies will look to defend their home turf they NIU host Miami (Ohio) and Bowling Green in a pair of home matches this weekend. The Huskies will close out their home schedule when they host Miami (11-5-1, 4-3-1 MAC) at 2 p.m. Friday before facing BGSU (4-9-4, 2-3-3 MAC) in a 1 p.m. contest Sunday. As the Huskies (7-7-1, 3-4-1 MAC) wrap their home schedule, they also will recognize October as Breast Cancer Awareness Month. In both Friday and Sunday’s contests the Huskies will wear pink warm-up gear prior to each match in an effort to raise awareness for breast cancer. At each contest pink T-shirts will be available for purchase, and donations will be accepted, with all proceeds going to the Susan G. Komen for the Cure foundation. At home this season, NIU has recorded five shutouts en route to a 5-1-1 record at the NIU Soccer and Track & Field Complex. The Huskies are undefeated in DeKalb since the start of Mid-American Conference play, with a 2-0-1 record against conference opponents at the NIU Soccer and Track & Field Complex. On their home turf the Huskies average 13.4 shots a game, and have fired 49 shots on goal compared to their opponents 19. Northern Illinois has held its competition to just two goals in seven contests, while the Huskies have edged out their competition, 49-13, in cornerkicks at their home field. Recognizing the team’s success in DeKalb this season, head Northern Illinois women’s soccer coach Carrie Barker is looking forward to competing at home after a four-game road stretch. “We’ve been on the road the past couple of weekends and we’re really excited to be competing back home,” Barker said. This season, the Huskies are led by Kelsey Passaglia who owns a team-high eight points on three goals and two assists. In her second season with NIU, Shelbi Johnson has become an offensive leader, earning five points on two goals and one assist. Megan Harry leads the team in assists with three, and has totaled five points this season. Miami is paced by Jess Kodiak who leads the league with 22 points on seven goals and eight assists. The RedHawks’ Katy Dolesh has also been a striking force for Miami. Dolesh sits fifth in the MAC in points with 15, while ranking sixth in goals with six. The RedHawks hold an 8-4-1 all-time series advantage over the Huskies. Entering Sunday’s contest, the Huskies hold a slight 7-6-1 series advantage over BGSU. Bowling Green’s Alyssa Zuccaro leads the Falcons with 21 points, on a team-high eight goals and team-leading five assists. Zuccaro’s eight goals are tied for first in the conference. Falcons’ keeper Alexa Aresenault also ranks among the top MAC contenders, as she sits in fourth place with 73 saves, averaging 5.21 saves per game. Following this weekend’s contests, the Huskies will conclude their 2010 regular season when NIU travels Thursday, Oct. 28, to Western Michigan. 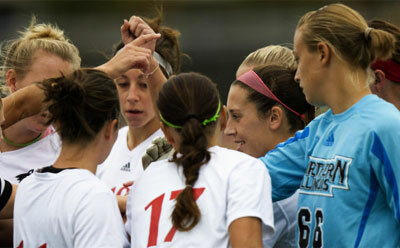 For more information on NIU women’s soccer and Huskie athletics, visit www.niuhuskies.com.